He barked "You can't slay my baby like this. You do not recognize how dear it is to me. Just stop the torture and start over again". It was 2 am in the morning, and there I stood sodden in sweat carrying an empty oxygen cylinder in the computer science lecture hall. I wanted to flee from that chaos. All I wanted was to head home and sleep. There were classes next morning, and I needed at least 4 hours sleep. "What the hell are you looking at? You stamped on my baby and is still waiting like a mule? I told you to go and start over again”. I had no other go. I ran back to my position and on the clap, turned myself into that edgy hospital cleaner with appalling dust allergy. Aashan kept weaving his fingers through his long hair staring through his glasses to catch the slightest mistake made in my movements. I had around 32 entries in the 30 minute drama, and had to be at my toes for the whole of rehearsal. It was tough. It was 8 years back when we started the rehearsals of the 'Janalakkapuram' (Beyond the windows), which won the B-Tech and University arts festival for best Malayalam drama, and then went ahead to get us the 'Premji award' for the year. It all started with that initial excitement when PP came and told me about the selection for the year's drama. It was just too overwhelming for me to even attempt acting in a drama directed by a 'School of Drama' product and starring 'Kunju', the boy wonder who acted in the famous serial 'Mandan Kunju' and many movies (he was our senior in college). We were damn thrilled when PP, Appoopan and me got selected among the 8 actors in the drama. But when the actual rehearsals started, it was much different from what we had in our mind about acting. We knew that Aashan was an intellect (Buji) who was a specialist on stage direction. What took us by surprise was the seriousness and professionalism that he showed when he made students like us work on his script named 'Janalakkapuram'. Starting off with making us read the script multiple times, going through the austere routines of stretching /face exercises, and then on to the real rehearsal sessions where he used to go real wild when the smallest slip was committed. He was vigilant to the extent of checking tones and pitch variations during dialogue delivery. It was tough for us since the rehearsal used to start only 10 pm after Aashan reached some 'form' thanks to the supplements, and used to carry on till early hours. The tension grew when the actual dates of drama neared, as Aashan turned more vigorous with his approach, making us endure the toughest of rehearsals. There was constant swearing even when a minor tone was missed during our dialogue delivery. As we were collecting the dry leaves for replicating the stage during rehearsals, I and PP used to think about just quitting since the tension was starting to hit our mind hard. However, the knowledge that we were all working towards the common goal pushed us on. All the hard work resulted in jubilant triumphs in actual stage behind the curtains, as roars of applause from the crowd continued for endless moments and we won the coveted awards. As time went by, many a times I used to wonder what our Aashan would be doing... At times I used to slip back to those memory lanes where my hospital cleaner was yelling 'Niratho? Neelathadakamo? Athu verum vazhiyanu. Mortuaryilekkulla vazhi! Mortuaryilekkulla vazhi!'. Me, Appoopan and PP would talk over these dialogs every now and then, as we sat in front of the TV in Bangalore. We always ended up wishing our best to our Aashan from the depths of the heart. Come 2008, there comes a news that catches my eye. It’s about a drama where Mohanlal and Mukesh were acting, and was produced by Kalidasa Vision. Named ‘Chaayamukhi’, the drama was directed by one familiar Mr. Prashanth Narayanan. Yes, it was our Aashan. Finally he was catching the headlines, reaching the pinnacles he should have scaled much earlier. Although its the presence of Mohanlal & Mukesh in a drama (after Kavalam's Karnabharam) that captured the news attention, the fact remains that the great actors was impressed by the script of Chaayamukhi....That too to an extent where they admitted they were deeply moved by the concept. That’s where the credit goes to our dear Aashan. So much talent, so much emotion towards the art form, so much of intense dedication....We all hope that this is just a beginning, and that we are going to see a director of the class of Adoor or TV Chandran. We wish you the very best, dear Aashan! I am writing this in the hope that there are still a few people who visit my blog, even after my lingering absence for the past 3-4 months. There have been many who asked me the rationale for this desertion. Well…there was no particular reason that I could tell. I have not at all been really busy like the Infosys days, I had not decided that I will stop blogging, I did not have any major change in personal life….Its just a patch of time where I just did not blog…Void of any particular reason. Just fell into a hole, I guess. Anyway, I have decided to lay low this long absence and come back to the blog world. You can expect more posts, and expect more madness to continue in 2008. The day I return though, is a sad one. One of the finest actors in Indian cinema, ‘Bharat Gopi’ passed away today. The man who arrived in cinema just because of his love for the art form, the man who won ‘Bharat’ award for only his first major role in ‘Kodiyettam’, the man who put that brave face and fought ahead with his life even after a severe attack of paralysis, the man whom each Malayalee will keep as a treasure in their mind – Bharat Gopi. Be it the innocence of the protagonist in ‘Kodiyettam’ who tells ‘Pho! Enthoru Speedu’ with sheer adoration in his face as his new dress is splashed with dirt by a passing vehicle, be it the comic role of panchayat president in ‘Panchavadipaalam’, be it the crooked ‘Maamachan Muthalaali’ in ‘Kallan Pavithran’, be it the malicious tabla artist of ‘Yavanika’ – Bharat Gopi has done what only he can do – Give the trademark of being an actor who stamped his ability to portray a range of roles to an inimitable perfection. We place you at the pinnacle of acting, and not many would touch that zenith during our life time. You will live in our hearts forever, Sir. The high pitched petulant tone of the calling bell sounded like an old soiled audio tape. Three youngsters were waiting in the verandah when she opened the door. Though couple of them seemed modern, it was the dhoti clad man who energetically greeted her with folded hands. “Yes?” Gloria Fernandez sounded impatient. “Heard that there is a car for sale here. We came to check that up.” The dhoti clad youngster directly jumped into the matter. Oh Christ! Although she was expecting it to happen sometime, this arrived as a shock for her. She wanted to hide somewhere. She should have guessed it, when they were looking around to spot the car shed. She had kept quiet whenever Jeffrey asked about it, and finally he took her hush as consent. “Please sit. Jeffrey will reach anytime.” She wanted Jeffrey to handle this mess. The youngsters seemed to be perturbed by Gloria’s abrupt bout of depression. “Will things go fine?” One of them whispered to Ravi, the dhoti clad man. Their hopes were on his business flair. Gloria felt that the folks waiting in the verandah had come to steal that final physical presence of love. She knew that the bungalow also will be lost soon. But then, the car had a lively charisma around it. When she looked through her window, she never observed the flat tires or the tons of dust that engulfed the car – All that came to her mind were those flashbacks of memories rushing through the narrow bridge of tears. Fifteen years back, as they marched with swift vigor in business, Melvin Fernandez waved his magic surprise wand at her in the form of a black ambassador car – A souvenir to her on their fifteenth wedding anniversary. As she gazed at that car, she could see all those reminiscences about Melvin unravel. She could remember that day when a ten year old Jeffrey jumped around with bliss, and the way they danced after sharing some wine. All of it seemed like yesterday. The progress in export business came rapidly for Melvin. From that small rented house to the bungalow with a garden and pool. Soon the car arrived. Even when the business grew to sky, Melvin never thought of changing the car. From then on – To church during Sundays, To beaches on evenings, To the shopping centers of the town, To different ceremonies, To hill stations whenever he got a couple of free days…. those pictures floated as bubbles in front of her. In all those images, she saw Melvin behind the steering with a Ray Ban glass, and to his left was Mrs. Gloria Fernandez. That car has been an inseparable part in their life for fifteen years. Even if it was almost pressed to the ground for the last six months, she was sure that the interiors will still have that fragrance of State Express and Brut. Her son Jeffrey, who is planning to drift to Australia, will never comprehend this. After the unforeseen demise of Melvin, he viewed the car as a white elephant. “Should it corrode in this sultry climate, with no one even starting it? Why is mother so stubborn? Anyway we are going to leave this place for our ‘home’ climate. If you just keep acting out of emotion, the car will be of no use for anyone.” This is his standard argument. He cannot understand…..His age is like that. Gloria could hear the sound of Jeffrey’s bike at the gate. “Hello! I am Jeffrey. You…?” She could hear Jeffrey speaking. “Oh! Please come. Did you see the car? Please note that we have already paid this years tax and insurance. No one has touched the car except Daddy. ‘Single Owner’, in its literal meaning. There will be some dust since no one has touched the car for past six months. No Bargaining. I should get 65.” Jeffrey directly got into the substance. Everyone walked to the shed with Jeffrey. Ravi started to inspect the vehicle in detail – He energetically ran around the car, looked under it and started knocking at different places to check the strength. Watching him looking at the car from diverse angles, Gloria felt that he would be an ideal person to choose animals for slaughter. She was watching them through the window. She saw Jeffrey coming inside to take the key. Gloria took the key in her hand and pressed her face into a pillow as she wept. The keychain was made of brass with a shape of Lord Ganesha, and it had the words G F Fisheries embedded on it. (G F for Gloria Fernandez). Melvin was very obstinate about having Lord Ganesha as the logo, since he believed that it would give his business a good prosperous start. He ignored the teasing words from Gloria, and told “An out and right Christian, and an out and right businessman”. “Mom, Where is the key?” Jeffery came to her after searching the desk. “Why are you crying, Mom? Anyway we will be parting this place soon. So what’s the sanctity in keeping that piece of junk? Please give the key.” He grabbed the key forcefully from Gloria’s hand. Yes. He will not understand. For him, it is just another junk piece of metal. He has been like this all the while. All that Jeffrey learnt from his father was his business mind. He never absorbed the values of Melvin - who made it a point to have some light moments that he enjoyed with his family in spite of the busy working hours, who put a heavy price tag to human emotions. When Jeffrey learnt that Australians allow Anglo Indians to migrate, he started running around to abscond from the place where he lived all the while. ‘Home country’, it seems! How can he even consider leaving these local boulevards through which the nomadic guitar tones linger, the gorgeous Chinese nets, the Gulmohar flowers and their sleepy fragrance, the melody of the lake and sea, the languid and loving people, the garden with chrysanthemum, begonia and anthurium in its borders and this bungalow that has Melvin’s breath in every corner? Yes. Jeffrey will never understand. He has always been like this. Gloria took the umbrella and opened the door. She burst into tears as she approached the car for one last time. As she kissed the steering wheel, she could smell Melvin’s cologne in her nose. She wiped her face and stared on, till she felt like leaving. Is Melvin opening the front door of the car and coming out? She could hear the sound of his shoes. She could feel his presence near her. Gloria did not know how long she stood there. “Mom, have you not gone yet?” Jeffrey’s question brought her back to the world. Gloria opened the umbrella and slowly started walking - to those memories rushing through her mind, to the air that smelled cologne, to the frames of life frozen with Melvin's picture. - Translation of a short story written in Malayalam by my Achan (which was published in a magazine). Today, it’s 5 years since he left us. Offered Scholarship in prestigious Massachusetts Institute of Technology. Rejected it for his moral obligation to the nation. Most of us know whom we are talking about. It’s about one extra ordinary person who remains stubborn and refuses to budge to the corrupted bureaucracy bludgeoning over him. He created mayhem among ‘officials’ when he widened the sides of a very congested and busy road in Thrissur town. He practically slapped on the face of a local minister who wanted to turn his hospital to a medical college without any mandated infrastructure. There are many more incidents to be quoted through, but you know where I am getting to. This stubborn gentleman who had made/is still making a huge impact among the youngsters in Kerala is none other than Mr. Raju Narayanaswamy. He was transferred a million times and insulted another zillion times by our government, before he escaped as he took leave for serving the UN who were excited to get a person like Mr. Swamy on their rolls. Time passed by, and a new government under VS - the very last comrade of a generation of inspiring ‘genuine’ Marxist leaders, came into power. Things started to look rosy when VS personally handpicked Swamy, Suresh Kumar and Rishi Raj Singh for handling the Munnar encroachment issue. Munnar might be that ‘one-off’ incident where the government itself supported a motion against corruption to such a large extent. There has been lot of pressure on VS, and he retorted to them saying “I have sent three cats to Munnar, and I don’t care if they are black or white. What matters is if they catch mice — and they really catch them, both big and small”. For the first time in my life I proudly heard a common passer-by shouting in the rain - ‘Leaders should be like VS, without bending his knees to the money of these big-shots’, as I watched JCBs bringing down those encroached structures at MG Road in Cochin. Things went on well…..ahem…not for long. In a typical case, a land scam involving a local minister would have bitten dust in the collector’s office – but not when Mr. Swamy is the around. The repercussions of the land scam came out loud, and a certain TU Kuruvilla resigned from his post. Quite obviously there were too many concerned faces in the assembly, as Mr. Swamy went ahead strong on his attempt to wipe the system clean. When he started exposing the illegal land holding of PJ Joseph and his kin, the ‘system’ started showing its clever face. VS was jolted on his rib by a hand that came from the back seat of a plane (yeah!! You guessed it right – the same hand that grabbed at a lady), and he suddenly, out of the blue, realised that Mr. Swamy was very inefficient in executing his duty as a district collector. Yes folks, the same VS who brought him back from UN to wipe Munnar clean got an ISD call from God - a divine intervention. VS made the announcement that Mr. Swamy was an inefficient district collector. The best part was yet to come – since he was inefficient as a district collector, they transferred him to be the….errr…..the…. district collector of Pathanamthitta. The mind-blowing solution suggests that all you need, to sort out your inefficiency, is to just switch the district. So all those failed cricketers, inefficient salesmen – here is the new mantra from our government, Just jump on the next KSRTC bus and move to the next district :). And what does the highly knowledgeable PJ Joseph say about Mr. Swamy? “This person has been transferred through 6 districts in 18 months. He is an immature official; he will be liability to whichever district he goes!”. Yes Sir, PJ Joseph! That was a hilarious joke from you and the UN is a bunch of idiots. We know that he was transferred because of only one reason – He is born as a man of ethics and he stands by it, like a man. These are not scenes from a Suresh Gopi movie. 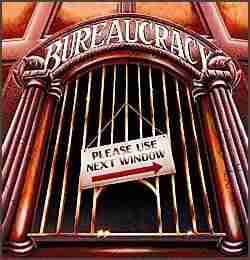 It’s something that has been happening right in front of us – making all of us citizens a bunch of sleepy hoodwinks. Shame on you, old comrade VS. Being a person who still admires the ‘real’ Marxian principles, I had a tinge of hope that you will do the state proud. But, shame on you! We know that you are powerless against the goons that actually rule the state. But I would rather throw the bloody chair and walk, rather than bending my back and my principles. I would hold my head high and take a stroll. I had been waiting for ‘Ore Kadal’ to release; right from the time the news about Shyamaprasad’s new movie based on Sunil Gangopadhyay’s novel ‘Heerak Deepthi’ started doing its rounds. Lot of things happened in between: Controversies involving novelist Subhash Chandran and Shyamaprasad, association of KR Meera in the script – but finally, the much-awaited movie released. Essentially ‘Ore Kadal’ analyses the intricate nature of human relationships through an in-depth portrayal of four complex and emotional characters. Making a movie that can belong to any contemporary time period/geography is a challenge of its own. Shyamaprasad can be proud of achieving just that. Mammooty plays a renowned economist Dr. Nathan who does not believe in any emotional relationship, and trusts that his mind is not to be bound to any specific individual or liaison. The careless debonair of an alcoholic intellect and the overwhelming guilt of being dispassionate, looms over the character of Dr. Nathan. Mammooty portrays the divergent images that take his mind between a rough unemotional exterior, and a warm confused interior, with ease. Meera Jasmin plays Deepthi, a mother and housewife who has the strings of her mind being pulled by the isolation that she despairs to leap out of. Deepthi has a gentle psyche that brightens on the unexpected love it finds, moves into a frenzy as it evolves through lust and reaches a devastated stage where she is caught between the passions in her relationships. As a person who thought that Meera often goes over that narrow border between acting and overacting, I should acknowledge her phenomenal performance in 'Ore Kadal'. At times I feel that the class of an actor is not in expressing strong emotions for short durations, but is rather in displaying the subtle tenacity of light emotions with consistency – Meera has done just that. If she could win Urvashi for T V Chandran’s ‘Paadam Onnu: Oru Vilaapam’, this should be a cakewalk. Ramya Krishnan does a fantastic job as Bela, a very mature character. She acts as the alter ego of Dr. Nathan, which acknowledges the weaknesses of Nathan’s character and tries to let Nathan observe it. The bottomless melancholy of grief from the hard times of her life shines through the hazel eyes of Bela, through her occasional glance here and a short dialogue there. In a cast jaded by superstars, Ramya does her part without a lot of drumbeats and applause – quietly going about her job and all the while exemplifying that her acting skills stands much taller than item numbers. Naren stars as the husband of Deepthi, a normal middle class person who tries to make ends meet for his family and at times is reduced to be a mere spectator as the drama of life evolves. For a movie that has most of its screen time indoors, the scope of impressing the people through camera work or technical gimmicks is almost negligible. Azhagappan accomplishes the near impossible - Using the light as a delicate background to the movie’s theme, and presenting some exquisite visuals. Editing a movie that moves between four diverse poignant characters, without the observer experiencing the turbulence of impulsive transitions requires a lot of skill, and the efforts from Vinod Sukumaran are laudable. The art direction and costumes made sure that the negligible space in Nathan’s flat was exploited to set up the careless slapdash attitude of his character. Unlike the so-called ‘mainstream’ movies, the music of 'Ore Kadal' had released devoid of ‘noise’, but it truly takes away the cake for being the vital part of the movie. Ouseppachan might have just made the best music of the year, especially handling the tough job of composing 4 different songs in the same raga ‘Subha Panthuvarali’ to match the moods of the movie. Shyamaprasad has returned with a bang after his 'Akale', which did not strike the right chord with audience. Although Shyam has handed over the accolades to his remarkable cast, the movie is essentially teamwork – A rhythmic coordination of a team striving for perfection. And for that to happen, we need a director who has a lucid idea about his theme and an approach to let his audience perceive it. As a director, there are umpteen occasions where he could have slipped off that narrow ridge, and fallen into the deep gorges of overemotional melodrama, lust or vulgarity. Shyam stays away from all of it, distances himself from forcing any judgment on the viewers and most importantly facilitates a rare opportunity for the spectators to come up with their own verdicts on the deeds of the characters. I felt couple of glitches in the movie when common sense gave way to continuity, but then - what is perfect? Dealing with such a sensitive thread of infidelity and betrayal, which often presents that thin line of morality to the viewers, is a colossal challenge by its own. We see a director’s shining signature that was displayed with ease in ‘Peruvazhiyile Kariyilakal’ and ‘Agnisaakshi’ reaching its pinnacle during ‘Ore Kadal’. Be it in that symbolic frame that occasionally interludes to cast the image of a secluded electric pole where a lot of power lines meet & disperse to new directions, Be it in the revelation that there is a ferociously lashing sea of ‘Self’ between the shores named ‘You’ and ‘Me’. The crowd expecting an outright 'masala' entertainer seeing the cast lines of Mammooty and Meera might be disappointed – as I could guess from the cat calls in the theatre. But, I regard a movie worthy if the mind lingers with the visuals and characters of the movie for days. 'Ore Kadal' has been so enticing that we could see ourselves standing next to Nathan & Deepthi, wandering in that dim apartment trying to reach that narrow frame of light through the balcony - all the while trying to come up with a conclusion on these complex yet amazing characters. That is exactly what I call triumph of a director and zenith of recognition for a movie. Verdict – Recommended, with Two Thumbs Way Up! In the interview with a Rediff correspondent, Ronen Sen (Indian ambassador to US) had made the statement “The agreement has been approved here (in Washington, DC) by the President, and there (in New Delhi) it’s been approved by the Indian cabinet. So why do you have all this running around like headless chickens, looking for a comment here or comment there, and these little storms in a tea-cup?”. The statement was obviously aimed at the news correspondents who twist the facts to increase the circulation multiple folds. The fun starts now: Guess who got so hurt and was all tears about the headless chicken? Sushma Swaraj, the BJP leader and former minister made this comment – “Today the ambassador has said in a statement that those who are opposed to the deal are headless chickens. We have demanded such an ambassador should be recalled,"
Well…This comment by Sushma did not come as a surprise since her chief focus as a minister was on banning a few channels in the pretext of maintaining ‘the so-called’ ethics and spoiling the name of national awards by giving it to naïve performances of Anil Kapoor/Saif Ali Khan (Kamal Hasan, Mammootty and Nasseruddin Shah might have dumped their Bharat awards when they saw the news), when the National Information and Broadcasting industry was being shredded to dumps. But what surprised me was when comrades like Prakash Karat/D Raja did not even glance through the essence of Sen’s statement and start crying aloud with a kerchief on their hand about chickens. People like us who ‘ve read Marx and Engels with respect and has soaring regards to their ideologies, have no much choice but to despise the state of the ‘new-age’ leftism which gazes for just some ‘air’ time in the controversy hungry news channels. If Sushma/Karat/Raja read between the lines and assumed that they were THE headless chickens, then I should appreciate that their self-evaluation is quite a matter of fact. Who else will waste the 22-lakhs/hour rate of running the parliament for such an amateurish self-appraisal? P.S -> This post is not aimed at analyzing the content of the agreement or on discussing any views regarding the authenticity of the agreement. Its directed at these ‘politicians’ that make a mockery of the parliament time when there are far more important things to be looked at in India, than their ego. I've been protected by some unknown forces and has landed back safe n sound after a 14 day trip to the planet named 'Himalayas'. Rewind….. July 2006 – Dhanush and Me watching Himalayan Odyssey 2006 in NDTV with awe, in Bangalore. Months of planning. Mixed emotions. 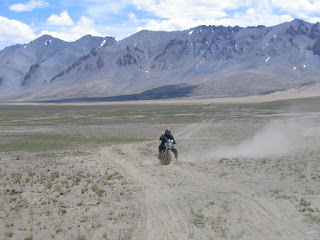 The ecstasy given by the very deliberation of disappearing to the highest motorable roads on a Bullet. A bit of hesitation. Getting the bike in shape for taking the trip by its horns. Some Confusions. Transporting the bike, and hesitantly adjusting to the fact of not riding it for a month’s time. Medical checkups with extensive tests to make sure that I am physically fit to take the expedition. Phone calls with Dhanush every evening to confer the preparations and strategies. That feeling of guilt for taking a break from work when my presence was really needed, and that prick of conscience of leaving Amma for 2 weeks. Answering the same old question most people had “Have you really gone crazy?”, as if this is the first time I am going insane ;-). Then boarding the flight to Delhi in Air Sahara on 22nd June. That’s the last I remember about this corporeal world. Being transported to a different planet is an experience to be enjoyed in person. It all started in the dry scorching heat at around 45-48 degrees in the Delhi-Chandigarh highway on Day 1, with a more human climate between Chandigarh and Manali on Day 2. 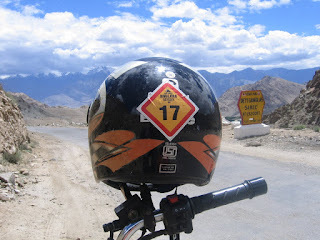 The opening day was inauspicious for me, with a fuel overflow recurring at regular intervals due to the impure petrol from Delhi – but I was fortunate to get it solved by shaking the carb, and was even more lucky as that was the sole problem my bike showed for the entire trip. The second day was quite appalling for our group, as some among us had pretty ghastly accidents though luckily nothing was too somber. As the third day started we observed a Buddhist Llama doing some poojas for us, and when our organizer Sachin told “Picnic is over. Real trip starts now” we got an insinuation of the ominous things in the offing for us. We passed a lot of tourist traffic till Rohtang pass, and from then on traffic was merely zilch except for a rare truck or army vehicle. The road to Keylong from Rohtang set things in perspective, as the whole concept of ‘Road’ started depleting with every kilometer and all that was residual was a lot of rubble with sand and mud from landslides. The much acclaimed ‘water-crossings’ started to present themselves in front of us. The streams just surge down the mountains and rule over the path, leaving it to our luck to negotiate the slippery rocks that are hidden inside the gushing water - the depth of which remains abyss. During a lengthy stream-crossing, the front tyre of my bike hit a rock that concealed itself deep inside the torrent, changing the direction of the bike to head right at the visage of our photographer Sundar who was kneeling down on the banks of the stream with his camera focused on me. Thankfully, somehow the direction of the bike got changed towards that of a narrow gap between the cliff and mountain named ‘road’and I could observe the amazingly quick reflexes of Sundar which made him run a mile atop the nearby mountain in 0.85 seconds to escape my bike maneuvering skills in streams :). Another 50 kms drive and we stopped at the fuel station at Tandi to top up our tanks. A signboard near the fuel station read “Next filling station 365 kms ahead”. I’ve never seen a signboard that has a better impact on your 'shiver' cells! At Keylong, the snow-capped mountains were luring us and it was sure that one of those mountains could be Baralacha La. 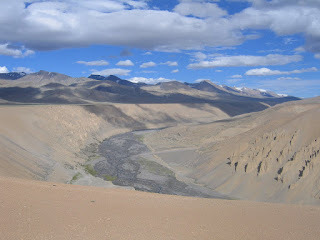 The next day hosted the nastiest road that we encountered in the trip (from Keylong to Sarchu). As I read somewhere during the research before the trip – Baralacha La is known as the ‘Killer Pass’, since it’s the first time we are to climb altitudes of the magnitude of 16000 ft and Acute Mountain Sickness will hit you out of the blue. The climb to Baralacha La started from a small camp at Darchu, and hardly 5 kms drive through pebbles and dust from Darchu we were welcome by an insane sight. Rubble was dumped to a height of around 10 inches in whatever was residual as ‘road’, that too for a stretch of around 4 kms of steep climb – Maybe for tarring the road in future. As we ran our bikes into that mess, an enlightenment of the intricate task at hand flashed right into our eyes. The tire was unable to grip at the layers of loose metal, while the ardent task of giving enough power for the bike to maneuver the acute angle climb was already making the journey thorny. People were using both their legs to gain balance and everyone knew that one false move at the right end of the road would take them down the cliff. Many bikes got stuck in the metal, and some went off balance. However the riders were up to the challenge and after some real testing moments, all of us managed to cross this unbelievable terrain. There was dust all around and we could see people gasping for breath after crossing this section. Personally for me, this was the most notorious part of the whole trip. After many more water crossings and non existent roads which were competing to give wake up calls to our spines, we reached Baralacha La. The presence of life had almost reduced to void with hardly any signs of civilization. It was just mountains, mountains and more mountains – snow capped ones, brown ones, green ones, rocky ones. The oxygen levels started to hit an all time low and I could feel it while driving, as I started to breathe harder. Even the activities that we normally regard as inconsequential were taking a toll on our body and no one was stopping at the chilly Baralacha La for taking snaps. All I could manage was to sit in the bike to take the camera from my pocket to take a snap of the signboard ‘Baralacha La’. By evening 4 pm we arrived at our camp for the day at Sarchu, where tents were setup by our logistics teamm. Mountain sickness had started taking toll on the group, and some people were in doctor’s tent under oxygen support. As night fell, my headache aggravated to an extent incommunicable and sleep was hard to come by. At times I could feel myself slipping off to that narrow gap of unconsciousness. The night was very long with the frosty cold and mountain sickness holding hands to deprive me any sleep, with a very jealous me looking at the peaceful slumber my friend Dhanush was in. I could feel the dawn break around me, but the lack of sleep and the painful headache was making me feel disoriented and it was tough to get the head upright. Next days drive covered the steep climbs of Gata loops, Naki La, Lachung La and the second highest mountain pass in the world Tanglang La. After some contemplation on taking the day easy by loading the bike on the truck and taking respite in the support vehicle, I decided that I could not let pass the fun. Quite a few people from our gang were already traveling in the support vehicles due to mountain sickness. It was tough to drive due to the disorientation that troubled me profusely during the 21-hairpin climb through Gata loops to Lachung La, compelling me take it easy and slow during this stretch although the roads were pretty ok. 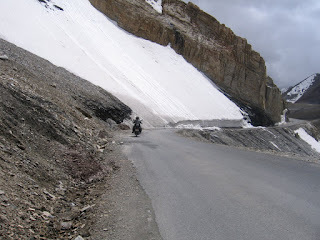 The key to driving a bike in Himalayas is to make sure that you do not gaze at the spectacular sceneries that unravel before you – A slightest slip in your concentration, and there you head into a part of road eaten off by the landslide. By the time we stepped on the 42 km cold desert at More Plains, I was physically doing far better, although the bike had lost a lot of its pulling due to the severe lack of oxygen. The view of More plains was just too celestial that it immediately froze a frame in my mind to treasure forever. A huge expanse of desert, surrounded by brown mountains at the horizon with an outline of clear blue sky - Words can’t describe the beauty nature lends to your eyes. But, the route through More plains is not as nice as its sceneries. Roads cease to exist at regular intervals and you are left to do some off road driving to negotiate the sand in the desert. Driving the bike on lower gears through the deep sand is a skill that we got first hand training on, in More plains. Many of the bikes were stuck in the sand, and we had to stop at times to help those people to move out. After successfully negotiating More plains, a grand snow capped mountain which sheltered the worlds second highest mountain pass ‘Tanglang La’ loomed over us. With great reverence to the pass, we embarked on the steep ascent to the top of Tanglang La which lasted for around 24 kms. The air was very wintry, with the wind chill making the effect worsen. No one even thought of stopping at Tanglang La and just drove on to flee the brute of nature. The days halt was at Rumtse, a valley right after Tanglang La. Yet another night where mercury dipped to unimaginable limits which left us shivering through yet another bout of mountain sickness. Sleeplessness had become a habit by now. 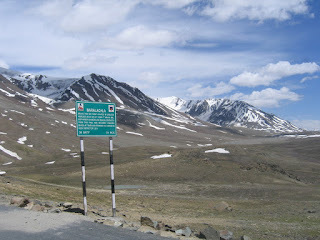 The following day’s ride from Rumtse to Leh was a nice and relaxed drive of just around 80 kms. We drove into Leh before afternoon in a 2*2 formation, the same way we did in all cities to make sure that no one loses their way. The next 1.5 days were to just relax, to complete all the repair activities for the bikes, and to make a small trip to the Buddhist Monastery at Shey. The visit to Khardung La, the highest motorable road in the world at 18380 ft, marked the half way mark of our trip – amidst the celebrations and cheering from the whole group. Surprisingly, the climb to Khardung La was far easier than the ones we had at Tanglang La and Lachung La. Since Khardung La was just 40 kms from Leh, we could wrap up the visit before noon to have rest for the remaining part of the day. Reaching till this point was a delusion for lot of us just two days back, when we were driving through the rivers and rubbles with attempts to just stay alive for the day. If the very thoughts of going through the same hardships on our way back were insane, we were up to the task in following up the madness. But the return journey was far easier since our body was acclimatized with the oxygen levels in the mountains and we were familiar with the roads. We stopped at More plains for an official photo shoot, since this might be the only place where all the bikes could be sheltered in a solitary snap. The distance that we covered in 3 days on the onward journey was covered in just 2 days during the return leg, with the only stay being at the Military camp in Pang. Living your life in that vacuum at Pang is not really human, and the first hand experience of what our soldiers are going through made all of us spare a thought for them. With the admiration for the border protection force going up multiple folds, we headed to reach Keylong through the minor snowfalls at Lachung La and Naki La. We covered around 340 kms through the toughest roads in just 2 days. The route we were supposed to take from then on (through Sach Khas-Chamba-Dalhousie) to reach our ultimate destination Amritsar, got blocked due to a landslide near Udheypur. After deciding the alternate route (Manali-Dharamsala-Pathankot-Amritsar), we visited Triloknath temple near Udheypur before heading to the camp set up near Chenab river in Udheypur. Rest of the journey involved just driving on the plains, with maybe the hilly stretch from Mandi to Dharamsala deserving a special mention for the joyous curves the route provides to the bikers. The numerous accidents involving our group as heavy rains lashed out between Manali and Mandi was probably the only difficult part during this stretch. It reminded me of the curving roads of SH33 from Kattapana to Thodupuzha that we took during the Bangalore – Cochin trip. The last day of the trip seemed to arrive in a flash. . The route from Pathankot to Amritsar deserves a special mention - for the ruthless high speed drivers irrespective of the vehicle they are driving and the presence of flies. After covering the 275 kms between Dharamsala and Amritsar in around 5 hours, we promptly headed to the Wagah border to watch the famous India-Pak flag retreat. The body did not accept the sudden increase in temperature, and lots of us were totally dehydrated by the time the retreat was over. Next dawn was spent in packing the bags, and parceling the bike back to Kerala through GATI. The chequered flag of the trip was marked by a quick visit to Jalianwalah Bagh and Golden Temple. The fact that the dream trip had ended hit me hard while sitting in the train from Amritsar to Delhi. The wonderful people that we got acquainted with in the trip and the blissful places where we drove on - all of them hung as frozen frames in my mind. The helping hands that we got from the support engineers from Royal Enfield, each of them – Jagdish, Vinil, Alex, Lovely, Solomon Annan and Ganesh enabled our group to ride on, in spite of the rough terrain, rivers, oxygen issues. The wonderful logistics arrangements by Ashokji combined with the organizing efforts from our leader Sachin, made the trip such a pleasant experience to remember through the life. A special gratitude to our team doctor Dr. Bishan for giving us the required support in spite of the harsh conditions at those altitudes. The oxygen cylinders certainly benefited many team members to survive. Then the terrific Mallu gang that came with us – Anoop and Gopettan - The encyclopedias of bikes, giving us the much looked-for gyan on many things that we didn’t know about the technicalities of bikes, Aravind with his daring attempt for doing such a grueling trip on the oldest bike of our trip – a 1987 model Standard 350 – Me and Dhanush rode with Aravind for most part of the journey and always tried to stay behind his bike due to sheer respect for the pioneer, Then the energetic spirit of the oldest participant of our group – Balettan, the 50 year old banker who led us by example in keeping our energy levels high and spirits upright throughout the journey. One mandatory thing during a trip, especially an arduous one like this, is a group of people of comparable wavelength and that’s unerringly what we had in this one. Then, of course, one Mr. Dhanush is always there – from planning and execution, to closure – suffering from acute chalu sickness due to my presence – without whom, the whole trip would have still remained a dream for me. You tend to forget the unhappy incidents in the trip – the accidents and health issues of many team members (most of which I have not mentioned here), and take your psyche back to the breathtaking memories that nature gave you. What I experienced was totally different from what I had thought as a naïve thrilled biker who wanted to just roam through places. The resilience test that you will be put through is much harder than what you imagined. But, you emerge a much strong hearted person and the memories can’t be more rewarding. I close my eyes and can see those gorgeous brown mountains capped with snow, gradually merging into the dazzling cerulean skies. Those castles carved by wind on the faces of mountains, the eerie stillness of the valleys that you see for miles below, the twisting winds that roam freely in the cold deserts, and a mere mortal watching it with awe…. It’s just a ‘once in a life time’ experience. Between 24th June and 7 July, I was ported to a different world altogether. A world where you had two wheels instead of two legs and your heart was a 350 cc engine that religiously took you from one destination to another. A world where you can turn your head around to see no signs of life for miles to come, but yet feel to be in the company of a heavenly power. A world that makes you realize how stunning this abode named earth is. A world that heaves you into vacuum, a world that throws you a foreboding challenge every single second of the journey through the toughest of terrains and most scenic of surroundings. A world that shows the insignificance of something named ‘me’ and makes you lose your identity. A world that makes you just surrender yourself to the overwhelming aura of nature. That’s Himalayas for you. For me, it will take some time for the reality to sink in. Half of my mind still roams in those gigantic peaks….among those valleys and snow clad castles, with one hand on my faithful partner - my Bullet. After 6 days of the toughest terrains and endurance skills, myself and Dhanush has reached Leh safely with our bikes in good conditions. The ride was much more difficult that what we thought it would be. Will update more once we are back home on 9th of July. The roads back till Amritsar is supposed to be even more difficult.